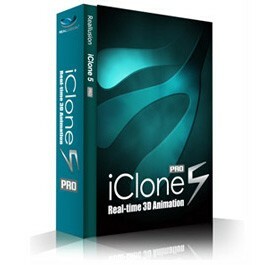 iClone5 has been built from the ground up as an essential tool for quick animation production. There is no other application in the industry that can deliver the speed, customization, flexibility and versatility of iClone5. iClone5's powerful engine allows for real-time animation, and motion capturing, which sets it apart from other 3D software as you can literally watch your animations while you create them. The possibilities are mind-boggling with this all-in-one animation studio! 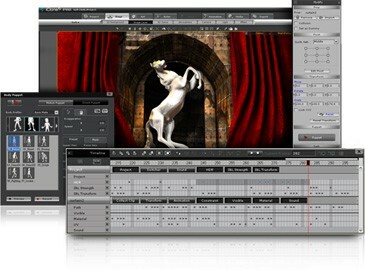 Real-time animation evolves with 3D Video FX, motion paths, HDR and rapid drag & drop creation inside iClone5. iClone5 introduces new features that combine video production with 3D real-time animation. The result is a powerful production tool for motion graphics, 3D animation and video compositing. Explore the speed and time-saving productivity of visual computing with 3D real-time animation. iClone is a fully-featured 3D animation studio, which has introduced students, professionals and independent filmmakers worldwide to the real-time art of 3D animation, digital storytelling and digital content creation. iClone revolutionizes the way we create animations. By working with the mocap device, iClone can turn your PC into an in-house mocap, and animation production studio. All skill levels of users can use his or her own body movements to control virtual actors and produce 3D movies. Prices at Aug 2012. Subject to change. We're locally owned & run. ©2012 Mentis Limited. All rights reserved.